I’ve been busy at work (more on that in a later post) and doing a lot of pleasure reading. It’s something that I’ve written about before — my rebirth towards TAKING TIME to read things other than IT publications. It has done wonders for putting my creative side back in proper alignment. You should try it. I want to talk about one of my personal villains to creative thought: how an issue gets framed. I swing by, and sure enough, the box isn’t opening. The combo buttons don’t work, the reset and opening latches are all unmoving. So I open the door, take off the doorknob, and go to work. I try to take off the exterior doorknob trim ring to pull the key box off, but there wasn’t one on the exterior side. A good thing; more secure. I’m looking and thinking, and keep wondering how I can pull off this dead key box. I don’t have a bolt cutter handy. Or at all. Note: my property manager had FRAMED the issue in my mind as being solved by a pair of bolt cutters! By planting this in my consciousness, the whole universe of potential solutions was brought down to One. I look again at the key box. Hmmm…there’s a tiny flat screwdriver slot showing at the top. It looks like maybe it’s only exposed when the box doesn’t close right. I insert a screwdriver, and the box opens! And from there I can remove the box from the doorknob without bolt cutters. I put on a new key box and life is good. But I’m not blaming my property manager…much. We find ourselves in scenarios ALL THE TIME where we can’t see all the potential answers or solutions because something or someone has constrained one’s thinking. My favorite example of this happened to my In-Laws years ago, and happily, I was able to break through the framing. Trust me: you wouldn’t hear about this if I didn’t. Or if I didn’t come out looking good. As I say on this site’s About page, such is the nature of history writing. When my In-Laws would go away on trips, we’d always watch the house for them. Collect any solicitations or hang tags from the porch and make sure the house looked occupied. 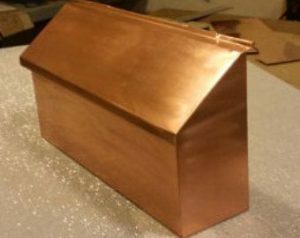 They had a large copper mailbox on the porch and a mailslot on the garage door. The regular mailman knew to put the mail in the slot (out of sight), but invariably a substitute wouldn’t know the drill. It never failed that they’d have some large book that would show up while they were gone: some item too big for the mailbox left on the porch and thus making it look EVEN MORE like no one was really home. The regular mailman wasn’t there, and the substitute would leave it on the porch. You can’t imagine the trouble we’d get into if they came back early to such a scene. They’d had a home break-in while they were away 20 years earlier, so you can perhaps empathize with a feeling of violation they didn’t want to be repeated. Dead silence. Glances at each other. Rebuttals began and then dropped with only the initial utterance. We went out with a screwdriver, removed the porch mailbox and repainted that bit of wall. The problem never happened again. Ever since then, when faced with a problem or scenario I try really hard to put the language of framing out of my head. It’s tough in IT support particularly. I always strive to develop a shared language with my user community in order that we both have common definitions to describe a problem. The user with the problem is trying to be helpful, giving you the most information possible about what’s happening, or not working right. But then you have to try and remove any solution constraints that will keep you from the most elegant solution. It’s not easy, but you’ll find over time you’ll be able to brainstorm better, with fewer roadblocks to potentially good solutions. Brilliant! And so true. I try not to diagnose my car for the same reason but then forget to do the same when looking for how to do other things.